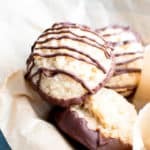 Healthy Coconut Oatmeal Breakfast Cookies (V, GF): this easy breakfast cookies recipe is chewy & crispy! 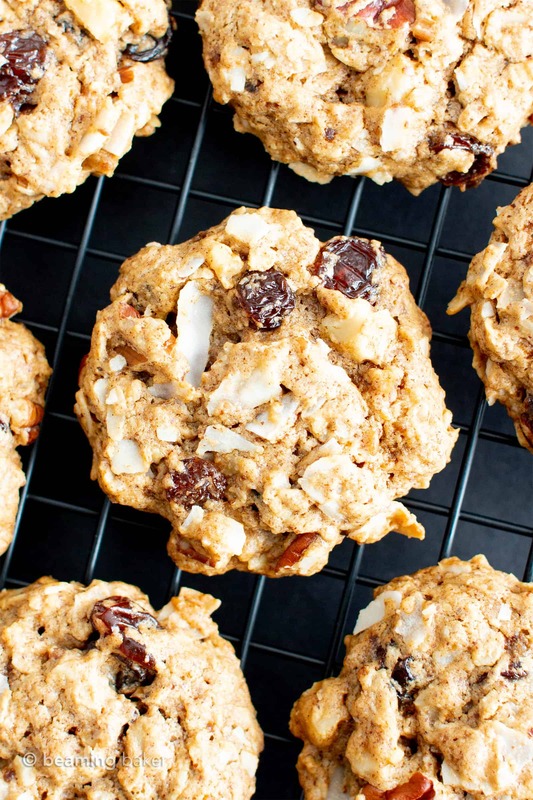 It’s the best healthy homemade breakfast cookies—vegan, gluten-free, dairy-free! Happy April Fool’s Day! Er… Happy first day of April! Are you a fan of all the hijinks that occur on this crazy day? I’m not one for all the devious shenanigans because I like to have my facts and proceed. Yikes, that sounds boring and such… but like I always tell Erik, I don’t like being Vanilla Sky’d. Lemme explain, when I watched that movie like 20 years ago (woah), I got so dizzy not knowing what was real and what was fake… and it left me wholly unsettled. And not at all whole. Lol. So April Fool’s is all tricks and such… and I’m like, what’s real?!? Who knows?? 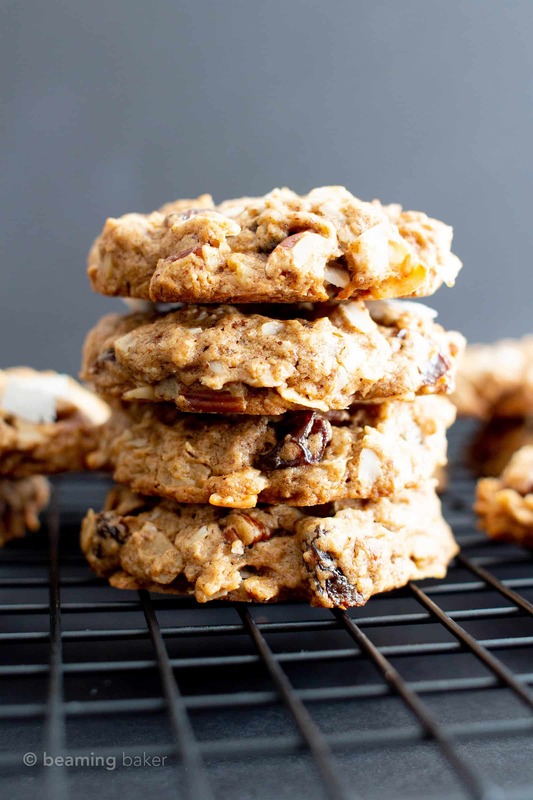 So trust me when I say we are not participating in these deceptive shenanigans today… but are, instead, celebrating National Healthy Oatmeal Breakfast Cookie Day. Okay, fine, that’s not a real holiday… but it seriously will be when you make these scrumptious healthy coconut oatmeal breakfast cookies! These vegan + gluten free healthy coconut oatmeal breakfast cookies are so easy to make, crispy on the outside, soft ‘n chewy on the inside, and the perfect way to start a non-foolish day. 😉 And if you’ve never made breakfast cookies before… well, today we’re gonna learn how to make healthy breakfast cookies together! No tricks, no fools, just: all the tasty and easy breakfast cookies! Yeah!!! Learning how to make healthy oatmeal breakfast cookies is easy! Simply stir together all the dry ingredients in a large bowl. Then, whisk together all wet ingredients in a medium bowl. Combine the two and fold in your add-in ingredients! Scoop & drop cookie dough and bake. Cool cookies & enjoy. So simple, right? 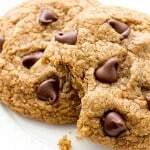 Psst… it’s just as easy to make my Best Gluten Free Oatmeal Chocolate Chip Cookies! 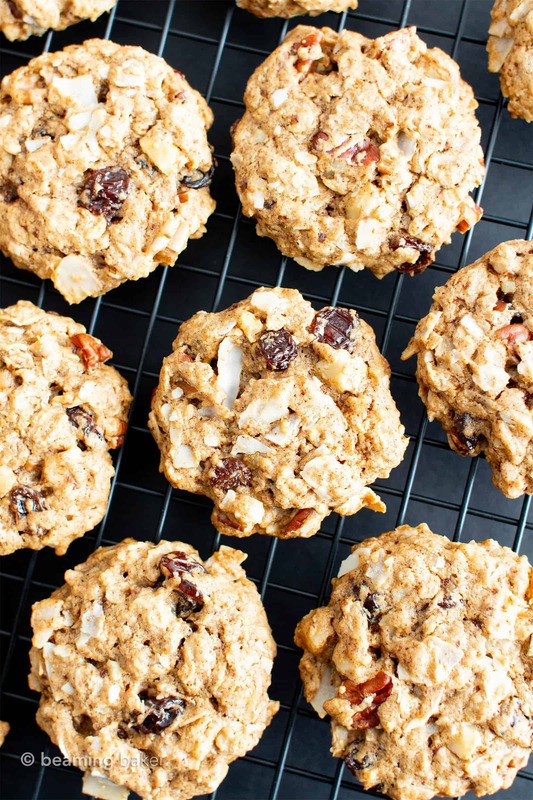 It’s even easier to customize this healthy oatmeal breakfast cookies recipe to your liking. I’ve listed the Add-in Ingredients separately in the recipe so you can swap them out easily. For the nuts, choose your favorite nuts or seeds. Raisins can be swapped for your favorite dried fruit! 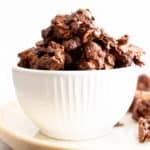 Just make sure to chop nuts/dried fruits finely, as big chunks of them will result in crumbly gluten free breakfast cookies. If you prefer peanut butter-based breakfast cookies, try my oil-free peanut butter oatmeal breakfast cookies. I’ve personally tested storing these healthy coconut oatmeal breakfast cookies, so rest assured. 😉 Store your homemade breakfast cookies in an airtight container for 1-2 weeks. The first day, the gluten free breakfast cookies are crispy on the outside and moist on the inside. By the second day, the flavor of these vegan breakfast cookies intensifies and the cookies soften a bit. So good! Gluten Free Oat Flour: try making your own gluten free homemade oat flour out of gluten free oats if you can’t access it. If not, try Gluten Free All Purpose Flour. 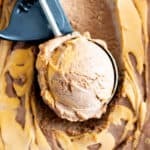 Natural Almond Butter: swap with your favorite nut or seed butter, such as: homemade peanut butter (or store bought), cashew butter, sunflower seed butter. Make sure it’s creamy. Here’s a tahini recipe if you’re looking to use that instead: Big Sesame Tahini Cookies (Paleo, Vegan). Coconut Oil: swap with melted vegan butter or a flavorless cooking oil. Coconut Sugar: swap with organic cane sugar or organic brown sugar. Nuts: swap with your favorite nuts or seeds. Finely chop large nuts. Raisins: swap with your favorite dried fruit, but make sure to chop it finely. 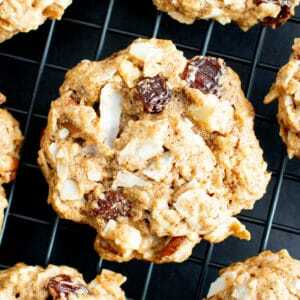 Large chunks will make these healthy coconut oatmeal cookies crumbly. Can I add applesauce? Try this gluten free breakfast recipe instead: Gluten Free Vegan Blueberry Applesauce Muffins. So… how’d you like pre-celebrating the would-be food holiday, National Healthy Oatmeal Breakfast Cookie Day, with me? 😉 Best excuse to make easy ‘n healthy homemade breakfast cookies EVER!!! All jokes aside, I truly cannot wait to hear what you think of my vegan, gluten-free recipe! Thank you for stopping by—it truly makes my day. 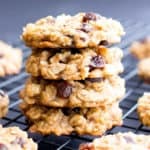 Healthy Coconut Oatmeal Breakfast Cookies (V, GF): this easy breakfast cookies recipe is chewy & crispy! 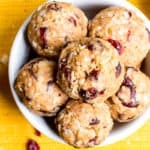 It’s the best healthy homemade breakfast cookies—vegan, gluten-free, dairy-free, refined sugar-free. In a medium bowl, whisk together all of the wet ingredients. Whisk until smooth. Pour the wet mixture over the dry mixture. Using a rubber spatula or wooden spoon, fold ingredients together until well-combined. Fold in Add-in Ingredients. Using a cookie scoop, scoop and drop cookie dough balls onto the prepared baking sheet, evenly spaced apart. Using a fork, flatten cookies to desired thickness. Bake for 10-14 minutes. Mine took 12 minutes. Allow cookies to cool on the baking sheet (placed on a cooling rack) for about 5-10 minutes. Using a heatproof spatula, transfer cookies directly onto the cooling rack to cool completely. Enjoy! Storing instructions below. 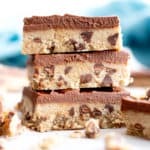 Also try my 1-bowl Banana Chocolate Chip Breakfast Bars, Good Morning Breakfast Cookies, and my Easy Vegan Peanut Butter Banana Breakfast Cookies. - The first day, cookies are crispy on the outside and perfectly moist on the inside. - The second day and on, cookies become soft and tender--and the flavor increases. So good! Click the links below for my favorite tools & ingredients used to make this vegan breakfast cookies recipe. Natural Almond Butter – smooth, creamy, and packed full of healthy fats and nutrients. Large Coconut Flakes – these coconut flakes are the perfect add-ins for yummy oatmeal breakfast cookies! Golden Ground Flax – the essential ingredient for making vegan egg replacements—flax eggs. Homemade Oat Flour – my personal recipe for making gluten free oat flour at home. Or, just buy it here: Gluten Free Oat Flour. Cookie Sheet – the sturdiest baking sheets. I love them! 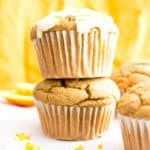 Previous Post: « How to Make Banana Muffin Tops (Healthy) – Easy Gluten Free Vegan Recipe! I love making these cookies every single time, especially for my 5 years old son. Thanks for the perfect recipe. I’m always partial to an oatmeal cookie and I love that these are GF! Perfect for an easy grab and go breakfast! Exactly! They’re the best quick breakfast snack! 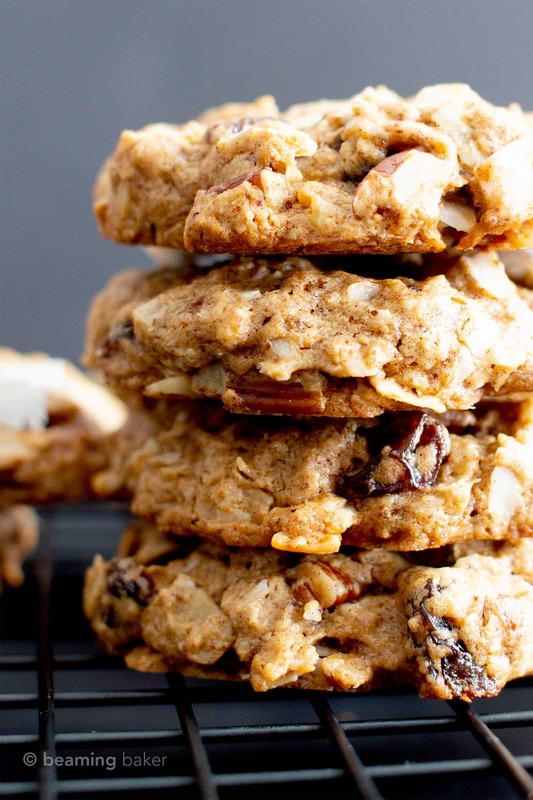 These oatmeal cookies look to die for! I am loving how they are Vegan/ Gluten free too. That means I can make a batch for my friend who has to follow a gluten-free diet. Saving this on Yum to make another day. Aw you’re so sweet! 😊 I hope you and your friend enjoy them! This is the kind of thing I need to snack on in the afternoon!! Totally! They’re so satisfying and soo yummy! I wish you were my neighbor…because I’d be knocking on your door asking for a few this morning for breakfast! Just love these!! Haha would that be nice. 😉 Thanks Lora! I just love cookies for breakfast 🙂 These look delicious! Same here, in case you couldn’t tell. 😉 Thanks Chrissie! The idea of being able to eat cookies for breakfast is already very appealing to me. If the cookies are as healthy as these coconut oatmealcookies, with such awesome flavor combination, I’m definitely digging in. Cookies for breakfast? I”m IN. 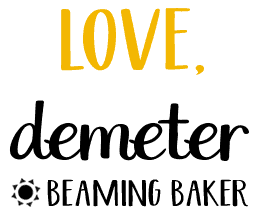 Hi Demeter, I wanted to tell you how great this recipe is. I am having one right now for an afternoon snack. I feel lucky to have your blog. I like how you have tested the recipes. You really produce a good product. i bring alot of your stuff to my Sunday school classes. They enjoy them, too. Let me tell you, thank you, for doing all this work. You are talented and I thank you, again. Hi Dezi, thank you so, so much for your wonderful & kind comment. It truly made my day. 🙂 It makes me so happy to hear that you’re enjoying my recipes, and so grateful that you’d take time out of your day to let me know. Big hugs to you!! Love how loaded these are! My kids will be thrilled when they see we’re having cookies for breakfast. Yum! Thanks for sharing! Haha oh I can already see their faces! 😄 Hope you all enjoy them! I would love to wake up to these cookies for breakfast! They look so tasty! 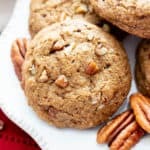 Oatmeal raisin cookies are a staple in my home; love every bite! I’m excited to try your recipe! Same here! 😄 Hope you enjoy the cookies Beth! I love how easy these are! Great for breakfast! Cookies for breakfast! That is a win for me! Love it! Haha oh yeah! Thanks Amy! Looks so perfect! Definitely a must try! This is such an exciting idea! Hi! I can’t wait to make these!! Do you know how I can figure out how much cholesterol these have? Thanks for a great cookie!